UTRGV thrives when alumni, students and community members believe in and want to support our students and programs. Through annual giving, donors can provide unrestricted funds to be used at the president's discretion for areas of greatest need. Your gifts may be used toward student life, scholarships, academics, research, or The UTRGV School of Medicine opening in 2016. These donations are critical to the growth and continued success of the University. Please contact us for more information on annual giving. Endowment gifts are a long-term strategic investment in UTRGV. With an endowed gift, you provide a permanent stream of support for the University. Your gift is invested through The University of Texas Investment Management Company and each year a distribution is made to your chosen program or area at UTRGV. Endowments allow today's donors to have a positive impact on this generation and on generations to come. An endowment also gives you the opportunity to honor someone important to you. You can name your endowment fund after a relative, friend, or someone else who has made a difference in your life. Their legacy will live on, while providing permanent support for UTRGV. For more information on forming an endowment, please contact us. Planned gifts can help you align your giving goals with your overall financial and estate plans. These types of gifts may benefit UTRGV during your life or after your lifetime. These donations include gifts made through your will, retirement plan or life insurance, charitable trusts, and charitable gift annuities. Many of these options offer you financial benefits, allowing you to make the greatest impact on our students, while preserving your financial security Contact us to learn more about giving through gift and estate planning. Gifts of appreciated securities and closely held stock can benefit you and UTRGV. You may receive an income-tax deduction equal to the fair market value of the securities, as well as reduce or eliminate capital gains taxes. Please contact our offices at (956) 665-5301 or contact us here for instructions for making gifts by stock or securities. Hundreds of companies sponsor matching gift programs and your employer may be one of them. Please check with your human resources office to find out if your company will match your charitable contributions. Many companies will also match gifts from retired employees, part-time employees, and spouses. Just fill out the forms required by your employer and you could double, or in some cases, triple your donation to UTRGV! 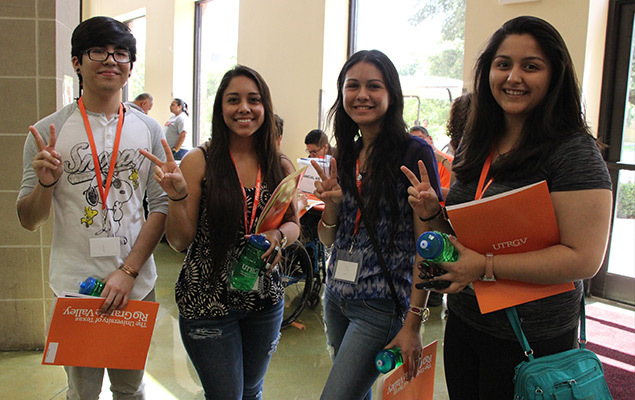 If your corporation or foundation gives charitable donations, consider partnering with UTRGV. We know that today’s corporations and foundations have a clear picture of what they want to fund and what results they expect to see. We work with corporations and foundations of all sizes to match their giving priorities with our goals as a university. As we launch UTRGV, now is a great time to explore our areas of greatest need and get in on the ground floor of countless innovative programs and initiatives. If you represent a corporation or foundation and want to learn more about our gift opportunities, contact Felipe Salinas at (956) 665-3298 or felipe.salinas@utrgv.edu. If you are a UTRGV faculty or staff member interested in applying for funding from corporations, foundations, or associations, please fill out the intent to submit form here. Are you a UTRGV employee? Through our Faculty/Staff Campaign, all employees have the opportunity to help the University reach its goals. Our faculty and staff provide a strong foundation for UTRGV through their daily work and their generosity. It’s easy to participate in the UTRGV Faculty/Staff Campaign with a simple payroll deduction. To enroll, click here.